Buckhannon’s no stranger to revitalizing its downtown and encouraging visitors to shop and stay awhile. 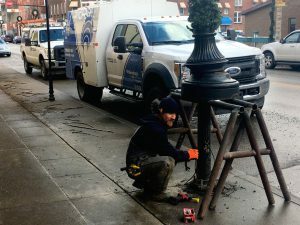 With its free on-street parking, growing events and businesses, there’s now an even cooler vibe on Main street with the recent installation of an outdoor sound system. To further the ambiance of historic downtown, officials had wanted to provide audio programming for a number of years. The ultimate goal was to make Christmas music available during the holiday season, as well as being able to broadcast during events throughout the year. A cost-effective solution was needed, enter Micrologic. 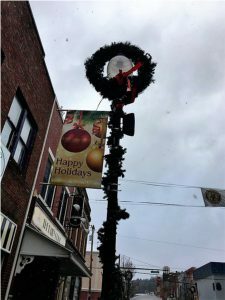 Just in time for the holiday, Micrologic partnered with the City of Buckhannon and the Upshur County Convention and Visitor’s Bureau (CVB) to make the season a bit more festive with the inception of the new downtown sound system. Making a statement to visitors and residents alike, its presence will aid in event broadcasting and overall ambiance with music and announcements along Main street. Joe Karp, Sales Manager at Micrologic explains more about this project and its impact in downtown. Joe: We partnered with the City of Buckhannon who was extremely helpful in supplying labor. We worked specifically with Jerry Arnold, Director of Public Works and his crew. Another partner was Laura Meadows, Upshur County CVB Director who received the funding … and lastly Emiel Butcher (Butch), President of Micrologic. Joe: Laura Meadows, Upshur County CVB Director, had mentioned wanting the capability to make announcements in the downtown area during events such as the Strawberry Festival and saw the appeal of having a sound system instead of bringing speakers out on street. Now there is the capability to broadcast throughout the entire downtown or play music for shoppers. Joe: Micrologic has the expertise for this kind of project and has completed a similar one at Premier Chevrolet in Morgantown. It was the same concept; Premier Chevrolet wanted music to be heard throughout the car lot. Additionally, we’re local, and they wanted to keep with a local company to provide the service – Overall, Micrologic just made sense. The downtown sound system has three different points with the capability to connect a microphone/music input at the CVB, Court House or the City Building. The next phase of the project would be to add a connection at Jawbone Park or extend Main Street on out to St. Joseph’s Hospital. Q: Do you think others could benefit from this type of service or partnership? Joe: Yes, definitely! Other towns, auto dealers, school systems or anywhere where customer traffic is flowing and music might add to the atmosphere or announcements might need to be made could benefit from this kind of sound system installation. Contact Micrologic today to learn more about how your company or organization could install a sound system to really make your business stand out!